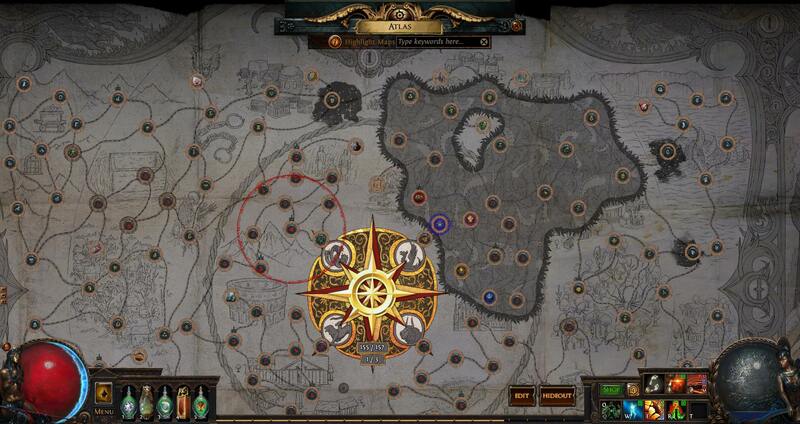 Working toward Uber Elder. Just having terrible RNG with Red Elder placement so far. How do you get even close to enough crit chance without crit strikes gem? starforge only has 5% base crit. - Sword damage nodes that lead to the node Fatal Blade on the right, toward the bottom side of the tree. - Optional: Can add a little to a Jewel, however adding multiplier at this point scales the damage higher. All this (minus the optional) gives 33% critical chance on a very fast attack. Now adding in a Diamond Flask (which you should) brings the effective crit chance up a little over 51% chance. TL:DR - With the scaling of raw physical damage, the more critical chance (like trying to cap it out) does not yield a higher damage return than stacking a lot of raw physical damage (Starforge) and adding as much critical chance and multiplier as you can while making the build survivable to all the content in the game. You get reliable crit with amazing physical damage. Subbing out any of the gems in the Cyclone set for Increased Critical Strikes will ultimately make you crit more often, but at a lower damage output. I hope this helps answer your question. Feel free to follow up if I have missed anything. If you are not relying on leech, why would you use slayer? Wouldn't champion or assassin be better? You are only getting cull and the "damage when killed recently" while assassin gives you more crit and every aspect of the champion seems useful. 1st comparison I'll do - Slayer to Champion. If you do not rely on leech at all there is an argument to be made. I'll admit, up until today I was not doing in my variant of the guide. (I'm currently using a Life leech roll on a flask and I might/will add it to a jewel at level 92) I do have other variants in the build that do take life leech, you can even take Vaal Pact if you like with a tankier build mindset, gaining the 20% damage and Life leech effects are not removed on Full Life. This is a great option in the build and can be very well utilized for survivability and a smoother play style. The biggest benefit to Slayer is the "Cannot take Reflected Physical Damage". This one is huge for maps, saving currency on rolls, random rippy phys reflect mobs. Culling is also a big damage boost depending on the HP of the mob, which in a boss's case is a rather generous chunk of damage. The aoe on slayer is also nice for fast map clearing. Cyclone really shines when stacking aoe with +weapon range nodes. 2nd comparison - Slayer to Assassin. The largest difference comes ultimately with Offense vs Defense. This holds true to both comparisons. I also believe the 20% aoe > 10% movement speed due to the fact the build already gains a great amount of movement and especially for cyclone all aoe = less back tracking on a section of a pack of monsters you might have missed w/out it. 1- Cannot take Reflected Physical Damage vs Damage from your Critical Strikes cannot be Reflected. The way the build scales, a high physical non crit damage with a not so great physical damage reduction can lead to some RIP moments. It also doesn't fully utilize the Damage on full Life gem, blood rage, and all degen ailments as well as Slayer due to the Life Leech Effects are not removed at Full Life. Being physically immune fully, also makes for easier mapping as well with mods and saving currency on rolling maps. 2 - The offense gained from the +% Crit chance and power charge generation vs Slayer damage. While the Assassin can reach greater heights in Tooltip dps/Path of building offense, the trade off is too much in my opinion and choice of playstyle. The offensive advantage Assassin has ranges from 5-14% more damage depending on how high offensively the build is scaled and how squishy you choose to become (looking at you HP). While the Culling strike gives the auto More Damage with that More damage only increasing in value the higher the health of the boss. This is again in addition to all the great survivability option in the Slayer. I hope this helps answer your question. Feel free to reply to add more to the discussion. I added a Video where I tank the Minotaur to test out some evasion changes with the build and Flask Set up for End game bosses. I will be adding more details in the Flask and Jewels Section soon. Finally got an Elder T15 spawn. 13/15 of the quest done. Finally getting closer to Uber Elder. I have been doing this solo after making 6 characters and farming a Headhunter. Sorry there is no vid up yet. I'm going to keep at it. Very interesting build, I'm making one myself. A question about the pure talent jewel ? I thought u have to allocate the starting point of a class to gain its bonus ? I see on your tree u only have ranger starting node and not marauder or duelist, how does u get increased aoe and other bonuses from this jewel ? Wouldn't carnage heart + the retch be a good choice? You don't need to worry about leech on jewel or flash. You just need to give up some range.